Lenovo A1000 smartphone was released and hit the markets on September 2015. The device is an entry device hence not much is expected of it. It measures 124.5 x 64 mm and a thickness of 10.6 mm. The entire body is a plastic material and weighs just 132 grams. Lenovo A1000 is a Dual SIM smartphone taking SIM cards of type-mini. On the front side, the Lenovo A1000 has a 4.0 inch screen with a resolution of 480 x 800 pixels. The display seems to be much sequeezed with a 57.2 % screen-to-body ratio. It has a 233 PPI density and supports multi-touch up-to 2 fingers. The display is of TFT capacitive touchscreen that is much responsive to even that soft touch. Out of the box the Lenovo A1000 comes running Android 5.0 Lollipop. The OS is lightly skinned and loads every app smoothly. Lenovo A1000 has two processors rated at 1.3 GHz that is just enough for the small device. This is layed over a Spredtrum chipset and a Mali 400 GPU that makes it possible to handle graphics with simplicity. Lenovo A1000 is one of the few entry level device to have one of the largest storage. It comes with few pre-installed apps that consume much less space. Out of the 8 GB you will still have plenty of storage volume. As if this was not enough, they put a dedicated microSD card slot that supports up to 32 GB. With this amount of storage one can download multiple apps and store large volume files. The Lenovo A1000 has a 5 MP back camera. It got a flash that helps in taking more clear images even in dark conditions. This camera can also record videos at 720 pixels and the overall of the camera is superb considering it is an entry level device. For selfie lovers this is not a device for you as they did not equip it with a front camera. Lenovo A1000 got a 2000 Li-Po battery that powers it. It is removable and can be accessed by removing the back panel. The battery can take you throughout the day on average usage and there is an ultra battery option to help it even last longer. 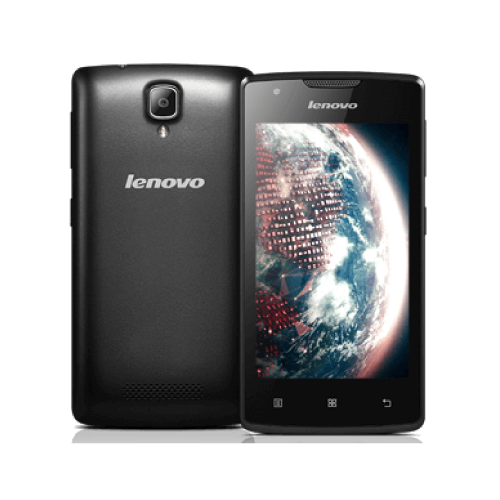 Lenovo A1000 is available in Onyx Black and Pearl White colors. the device is a good option if one targets to use a budget device. The only downfall is the absence of a secondary camera.